My first job following qualifying in 2001 was in here in Mallow. I gained great experience in the practical aspects of veterinary medicine under the guidance of Mr. Conor TW O'Brien MRCVS. I developed a fantastic rapport with the clients of the Mallow area which I have successfully nurtured and developed to this day. I meet clients and former clients on the street daily! In October 2004, I committed to full time companion animal practice in Cork City with Mr. Richard Healy MRCVS. Until mid 2011, I worked day and night for the betterment of the companion animals and performance racing dogs of the greater Cork area. In this practice, I thoroughly enjoyed the disparate client base and varied case load; clipping a guinea pig's nails in the morning and performing a caesarean on a Saint Bernard mother-to-be at 4am the next morning! My companion animal surgical and medical skills benefitted immensely from such exposure. I attended all of the weekend out of hours cases for this practice and on a rota basis for 3 other exclusively companion animal practices for 7 years. 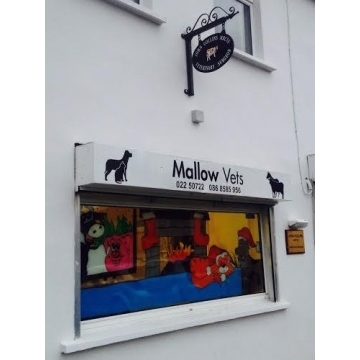 I am now offering the same first class service at Mallow Vets. The numerous thank you cards I received from clients of all of these practices is proof of my dedication, knowledge, kindness and professionalism. In February 2012, I was offered a fantastic opportunity to revisit genuine mixed practice in Co. Clare under the stewardship of Messrs TK Malone MRCVS, A O'Connell MVB and N Farrell. This practice attended clients from the tip of the Loop Head peninsula to Ennis town and from Kilrush to Lisdoonvarna (for the craic!). The work was mostly cattle based and I thoroughly enjoyed every minute of my sojourn in the Banner. Once described by Mr. O'Connell as UEFA Champions League style veterinary practice, I quickly found the description to be most apt! I doubt that any comparable Irish practice could be busier in terms of calvings, caesarean sections and general cattle and equine practice. My large animal surgical and medical skills positively blossomed during this most beneficial and advantageous internship. The disposition of the clients and practice team lent itself to a most enjoyable and memorable experience. I am proud to be remembered as an honorary Clare man. Up the Banner! I enjoy a varied caseload at Mallow Vets and love being on farm dealing with problems in real time. No two days are the same and one is never bored. When not working (very rarely), I adore cycling, building bikes, cooking and reading. My chosen subject is communist regimes, especially those of North Korea and the former German Democratic Republic. My wife and I have travelled extensively; from herding cattle on horseback in Montana to chasing camels in the Northern Territory, Australia. In December 2010, Tom was born and now we chase him instead!. Mark was born in June 2012 and is anxious to get his hands on the practice as soon as possible. Ruth, my wife keeps horses and I am charged with general maintenance and fencing duties around the place.